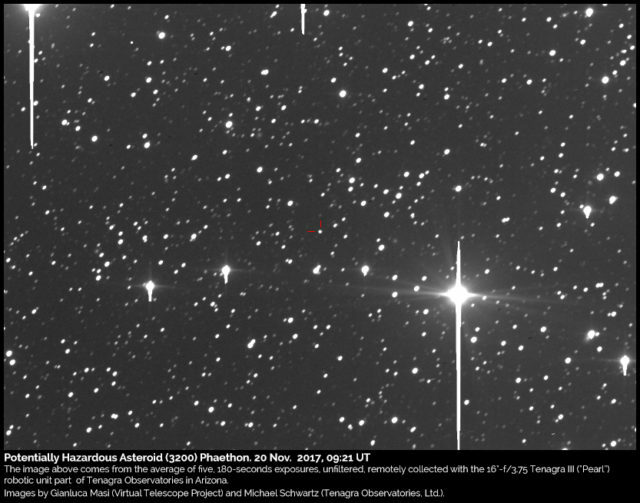 The unique asteroid 3200 Phaethon: bright 2017 apparition – see it online! 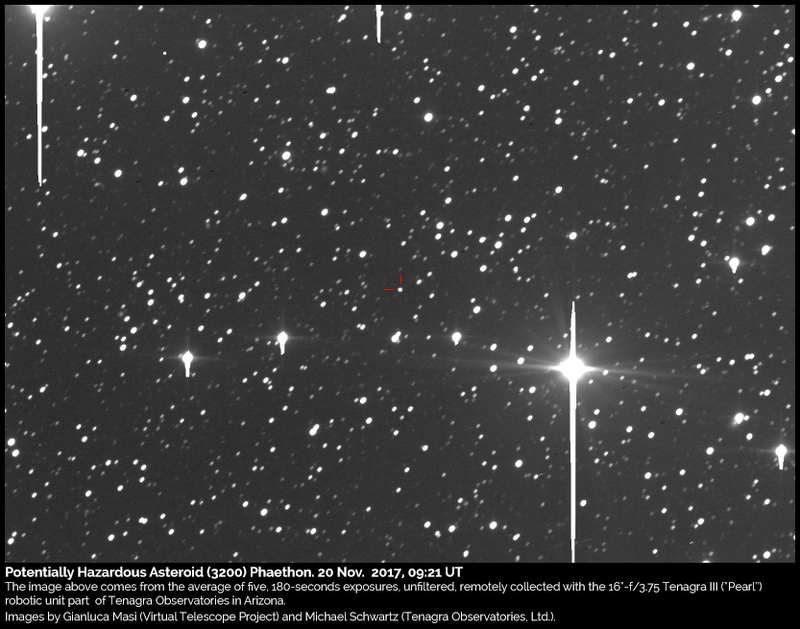 Among the asteroids, 3200 Phaethon stands out for a number of reasons. Discovered on 11 Oct. 1983, it was the first one to be discovered on images coming from a spacecraft, it moves on an orbit bringing it very close to the Sun and it is the parent body of the stunning Geminids meteor shower. Next 16 Dec. it will make a relatively close, encounter with the Earth and we will show it live, online. The exceptional features of 3200 Phaethon continues. It is a potentially hazardous asteroid, being big enough (5.1 km) and coming close enough to us (the minimum distance between its orbit and the one of the Earth is less than 7.5 millions of km) to be flagged this way. At its perihelion (minimum distance from the Sun), it passes closer than 21 millions of km from our Star (less than half of Mercury’s perihelial distance), with a peak temperature of 750°C: because of such a short distance, it was named Phaethon, after the son of Helios, the sun god. It was Fred Whipple to note, soon after its discovery, that 1983 TB (the provisional designation given to Phaethon at the discovery time) had orbital elements virtually coincident with the mean orbital elements of 19 Geminid meteors photographed with a super-Schmidt meteor cameras. So, at that time, 3200 Phaethon was the only asteroid recognized as the parent body of a meteor shower, instead of a comet (now we know that also the Quadrantid meteors have an asteroid as parent body). Having an asteroid as the source of one of the most spectacular meteor showers we know is extremely intriguing and not obvious to explain: a comet, with a lot of volatile material, is simply a perfect source of dust grains, going later to be used to make those nice meteors, once those dust particles enter our atmosphere. Several unsatisfactory theories were proposed to explain this, including a breakup event of a larger body, the collision of two objects releasing a cloud of debris, the hypothesis of a dead comet and more recently the idea of a “rock comet”. The real nature of Phaethon is still an opened question. The next 16 Dec. 2017 relatively close approach will be the closest one since 3200 Phaethon was discovered. To have something better, we have to wait for 14 Dec. 2093. During this apparition, Phaethon will peak at mag. 10.5 or so, easy to see and track with mid-sized binoculars. By coincidence, this close approach will happen hours later the Geminids peak, making this link even more fascinating. Previous story Geminids 2017 meteor shower: online observation – 13 & 14 Dec. 2017.